SHANGHAI, April 19, 2017 /PRNewswire/ -- Adient plc (NYSE: ADNT), the world's leading global automotive seating supplier, is unveiling several products and concepts at Auto Shanghai 2017, including many that were designed and engineered in China for the local, regional and global automotive industry. Adient, created when Johnson Controls' automotive seating business was spun off as an independent company in 2016, will be showcasing its AI17 level 3/4 autonomous vehicle seating demonstrator. Adient, through one of its China joint ventures, Adient Yanfeng Seating Mechanism Co., Ltd. ("AYM"), today announced plans to expand its metals and mechanisms plant into a new 970,000 square foot plant to be built in Changshu that will employ 2,000 employees, comprised of current employees and new local hires. "China is a key market for us globally, which makes Auto Shanghai an important industry show to introduce Adient to our China and regional customers," said Darlene Knight, Adient vice president and head of China operations. "China is a great story for Adient. Our unconsolidated seating revenue, driven primarily through our strategic JV network in China, grew approximately 13 percent year-on-year, excluding the impact of foreign exchange." Integrated Luxury Seat — the Integrated Luxury Seat combines contemporary and advanced features and functions, offering a luxurious look and feel to high-end passengers. Independently innovated, designed and engineered by AYM, this "captain" seat responds to the Chinese consumers' demand for a premium experience. "Luxury by Design" — Luxury by Design showcases a wide range of production-ready seating solutions in comfort, trim, user interface and distinctive aesthetics. Luxury by Design helps automakers find the intersection of luxury and affordability to create distinct interiors that align with the positioning of specific vehicle brands. Commercial Vehicle Seating — Adient will show an extension of the existing modular truck seat platform tailored for China and Asia Pacific markets. Seat Structures and Mechanisms — Seat structures and mechanisms, primarily developed and engineered in China, will be highlighted, including seat back frames, modular structures, seat tracks, recliner mechanisms and more. "As automated driving technology advances, the interior will become the focus for consumers," said Chung. 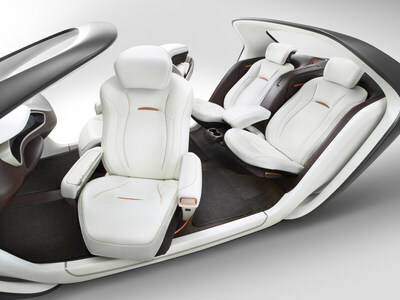 "The seating system will influence and enable experiences and interactions that deliver more emotional and physical enjoyment; that is why many of our products and concepts on display here in Shanghai are driving toward the future of autonomous driving." Additionally, Adient's Recaro Automotive Seating group is preparing its market launch in China as the premium brand manufacturer of performance seats for sporty luxury vehicles. Adient's product group is presenting tailor-made products for Chinese OEM customers and for aftermarket applications in China during Auto Shanghai. Adient's exhibit in Booth 5BA001, Hall 5.2, National Exhibition and Convention Center (Shanghai) will be open to media and invited guests April 19-20 and to the public through April 28. Adient has 17 seating joint ventures in China, employing approximately 31,000 team members in three global technical centers and 67 plants in 37 locations across the country. Adient is the global leader in automotive seating. With 75,000 employees operating 230 manufacturing/assembly plants in 33 countries worldwide, we produce and deliver automotive seating for all vehicle classes and all major OEMs. From complete seating systems to individual components, our expertise spans every step of the automotive seat making process. Our integrated, in-house skills allow us to take our products from research and design all the way to engineering and manufacturing – and into more than 25 million vehicles every year. For more information on Adient, please visit adient.com. Ushering in a new level of contemporary luxury in autonomous vehicle seating, Adient, the world’s largest global automotive seating supplier, today unveiled its updated state-of-the-art luxury seating concept for level 3 and level 4 autonomous vehicles at Auto Shanghai 2017.